Odisha Governments Higher Education Department has publish the the Common Application Form (CAF) for the Plus Three (+3) E-Admission 2018 in various stream such as Arts, science, Commerce and self financing courses from 12th June 2018 (6:00am), last date of online apply 26th June 2018 (12:00am). The students those are interested to take admission into any Government or Private college for B.Sc, B.Com or B.A course should fill the online application form that is Common Application Form (CAF). The online application will be made available in the Govt. of Odisha Higher Education Department website www.dheodisha.gov.in or www.samsodisha.gov.in from 12th June 2018. The various dates regarding the E-admission process and detail step by step procedure for online admission is mentioned below. Publication of Vacancy List at college Notice board and Spot admission or College transfer. This E-Admission process which is managed by Student Academic Management System (SAMS) consists of followings steps. You should read these steps carefully to know the details admission process. This year the online registration is slightly different.First candidates have to register his/her mobile Number, Email Id with the SAMS ODISHA website, then he/she has to set a password for the application. After that he/she can fill his/her application form. The details process is exlained step wise. 1. Click on this link to go to the registration website, You will see a page as shown below. 2. Click on the NEW STUDENT, REGISTER NOW, you will see a page as shone below. 3. Enter NAME OF THE STUDENT, MOBILE NUMBER and EMAIL ID, then click on the GENERATE OTP button, you will receive an OTP SMS in your MOBILE NUMBER. Enter that OTP SMS to verify on the next page and CHOOSE A PAASWORD for your application. Now the REGISTRATION PROCESS is completed. Next step is the filling of online application form. 1. Click on this link to go to the SAMS ODISHA LOGIN page. You will see a page as shone below. 2. Now enter your MOBILE NUMBER , PASSWORD and CAPTCHA CODE. Now you will see a page as shone below. 3. Click on the APPLICATION FORM, you will see a form as shown below. After that he/she has to give their choice of college in which he/she want to take admission. Here you can choose any number of college from list of colleges all over Odisha. Give as many choice as you want. After that submit the application form. Take a print out of the system generated application form in A4 Size papers. 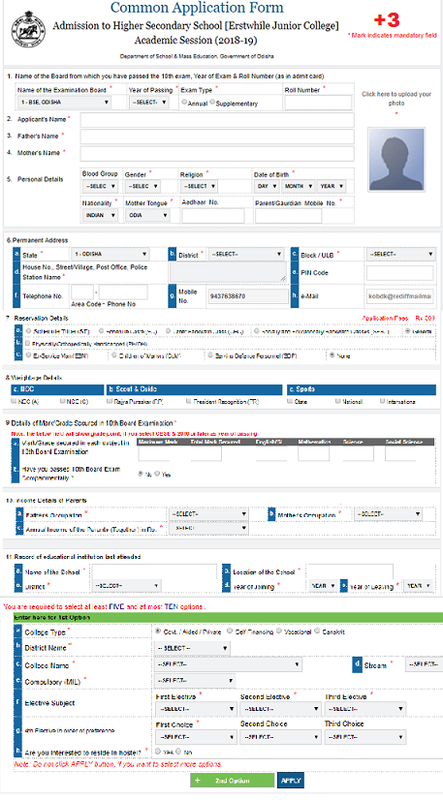 Now click on the fee payment option, now you can pay the fee via online mode by CREDIT CARD/DEBIT CARD or NET BANKING. That all, now take the print out of the online application form. with the application form. Now go to any SAMS centers near by you (Every Government College Has a SAMS center to accept the Hard Copy of application) and submit your application. You have to pay the application fee in SAMS centre. After paying the Application fee , take the MONEY RECEIPT which have a MRN number. This MRN number iwill be used to know the status of your admission. Last date of submission of Hard Copy at SAMS center is NOT DECLARED yet. After this two steps the students work is over. Now the department will scrutinize these application form. The department will publish the First Selection List of the candidates those are allowed to take admission into the college according to there +2 mark in the official website. The candidates are bound to take admission to the college which will be allotted to him otherwise he will be removed from the admission process. To know your allotted college, go to the DHE website, enter your MRN number, then print the Allotment letter. This allotment letter is required at the time of admission in the college. So if a candidates has not get his choicefull college should also take admission on the provided college, because he/she can change his college after admission if vacancies will be available in his choice full college. So don't do the mistake. How To Take Admission ? To take admission you have to go to the allotted college with your print copy of application form which you have received after submission your application at SAMS center. The college will take the required admission fee from you, and your admission process will over. After the completion of the second round admission, a balance sheet will be prepared to see the vacancy positions in every colleges. In this vacancy round, only the SC/ST are allowed to take admission in the colleges.So the ST/SC candidates should register again in the website for the admission. After the third phase admission, the department will publish a balance sheet to see the remained vacancies in various college. This is the time in which a candidates can change his college by contacting with his college authority. Here the candidates those have not yet got the sheet in any college can take spot admission into the vacant college. Class of +3 1st Semester (BA, B.Sc, B.Com) will starts from 16 July 2018. These are all about +3 E-Admission into various Collge in Odisha throush CAF. The students those have passed in the supplementary or instant exam 2018 can take admission within 20 days from the date of publication of their result.